The constructor from another angle. 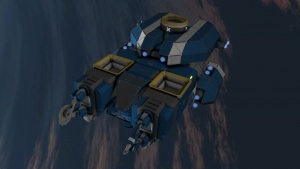 The Constructor is a small pre-fabricated utility ship found on Easy Start 1 and Easy Start 2. 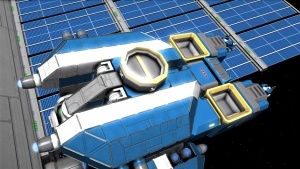 It's a fairly well designed construction ship with both a ship mounted Welder and Grinder, Spotlights and fully oxygenated cockpit with on board storage. Large Conveyor port connected Welder and Grinder, each with a collector nearby. An oxygenated Cockpit located in between the welder and grinder providing an convenient vantage point. Large Reactor providing 14.75 MW. Large Cargo Container providing the equivalent cargo capacity of a large grid Small Cargo Container. 24 Small Thrusters: 6 forward, 6 backwards, 4 up, 4 down, 2 left and 2 right. 2 Spotlights for easy lighting. Connector port at the top of the ship. An Oxygen Tank connected to the cockpit. This page was last modified on 18 March 2016, at 16:46.